Without a doubt, few technologies in SQL Server cause as much confusion and the spread of misinformation than indexes. This article looks at some of the most asked questions and a few that should be asked but often are not. We’ll be using SQL Server 2016 for the examples and a free tool, for SQL Server query execution plan analysis, ApexSQL Plan, to explore the effects of indexes on a typical business problem: A table of customers. Question 1: What is an index? It continues and has two pages as of this writing. A quick glance at the list tells you that the species are arranged alphabetically by their common name. Imagine though, that you are a biologist and are used to using the Latin names. How would you find the entry for the Thunnus and Katsuwonus species? Well, you’d need to read right to the very end of the list, since that has the common name tuna (like the one in your sandwich!) and is the last one in the alphabetical list by common name. “Fine!” you think. It’s not so hard to read through two pages to find what I’m looking for. Now, imagine that this list holds all the known species in the world (about 8.7 million) similarly arranged. Reading through that list to find a species by its Latin name would not be much fun for you and would need a lot of I/O on a computer. In a database, I/O is often (if not always) the single greatest bottleneck. If we can reduce the I/O required to find the information we want, we can effectively give the bottle a bigger neck. This reduction will also lead to secondary benefits, such as reduced CPU time, waits, cache use and more. The goal of an index on a database table then is to reduce I/O. To understand how this works, we need to first look at a table that has no indexes. Question 2: What does a table look like without indexes? SQL Server keeps all data in all its files for all databases in 8K pages. There are at least two files for every database: one for the data, which has the default file type .mdf, and one for the log, which uses .ldf for the default file type. Each table in the database has one or more pages. To keep track of those pages, SQL Server uses a special set of pages, called IAM (for Index Allocation Map) pages. In spite of the word “Index” in the name, IAMs are used for non-indexed tables as well. These are called heaps. All the data is there, but the only way to find anything is to read it starting at the beginning. For a very large table, this will be terribly inefficient. Let’s see what happens with just such a table. Estimated rows = 1! That’s because SQL Server expects just one customer with the matching id. There could be more (since at this point there’s nothing to prevent it) but there’s just no way to know for sure. If this table was part of a busy OLTP system and had millions of rows and thousands of simultaneous searches, this would put a nasty drag on system resources. Even if you could hold the whole table in the buffer pool, that would make those buffers unavailable for other queries. Either way, this will make for a sickly server. Appropriate indexing is the cure! Question 3: What types of indexes are available in SQL Server? Clustered A clustered index sorts and stores the data rows of the table or view in order based on the index key. This type of index is implemented as a B-tree structure that supports fast retrieval of the rows, based on their key values. Nonclustered A nonclustered index can be defined on a table or view with a clustered index or on a heap. Each row in the index contains the key value and a row locator. This locator points to the data row in the clustered index or heap having the key value. The rows in the index are stored in the order of the key values, but the data rows are not guaranteed to be in any particular order unless they are in a clustered index. Unique A unique index ensures that the key contains no duplicate values and therefore every row in the table or view is in some way unique. Index with included columns A nonclustered index that is extended to include nonkey columns in addition to the key columns. Filtered An optimized nonclustered index, especially suited to cover queries that select from a well-defined subset of data. It uses a filter predicate to index a portion of rows in the table. A well-designed filtered index can improve query performance, reduce index maintenance costs, and reduce index storage costs compared with full-table indexes. Full-text, Spatial and XML indexes are outside the scope of this article. We’ll concentrate on clustered and non-clustered indexes and look at some of their extensions including unique and filtered indexes and the usefulness of included columns. Although not mentioned above, we will also not be looking at columnstore indexes in this article, nor in-memory tables. As described above, a clustered index affects how the data is actually stored. In a heap, the data rows are stored in no particular order. They are written wherever they fit while putting the minimum load on SQL Server resources, such as the buffer pool and the I/O subsystem. On the other hand, when you create a clustered index on a table, the organization of the data is changed so that it is now in order according to the keys specified. The entire index is organized as a B-tree (“B” stands for balanced), where the leaf nodes are the actual data pages and one or more levels of index nodes are built on top of the leaf nodes up to the single, root node. The result provides some guarantees regarding the asymptotic performance of the index. Most operations (search, insert and delete) operate in O (log n) where n is the number of entries in the index. Included columns – which can carry a subset of non-key columns as part of the index. If you think through the implications of these descriptions, you should be able to see that a table is either a heap or a clustered index. Other implications are that since the leaf node of a clustered index is a data page, there is no need for included columns (since all columns are in the data page) or filtered indexes (since the clustered index is the whole table, by definition). A more subtle insight is this: Since B-Tree theory does not stipulate key uniqueness, a clustered index may have rows with duplicate keys. In that case, SQL Server will add a hidden uniqueifier (a 4-byte integer) to the index to enforce uniqueness. Question 4: What happens when you create a clustered index? Free up the pages used by the data rows before the create index. This is pretty much as expected! Reading from right-to-left, the table contents are read (table scan), 100,000 rows are sent for sorting, then the sorted data set is sent to an IndexInsert operation, which creates the index nodes. The parallelism operator indicates provision for a parallel IndexInsert operation, which can be run in many parallel streams depending on the number of available CPUs. Finally, the new rows are INSERTed into the table. We don’t see an operator for releasing the now-unused pages, but then that is a background operation that you will never see in an execution plan. Now that we have a clustered index in place, will that affect our original query? The original table scan has been replaced with a clustered index seek. Will that help reduce the I/O used to get that row? Let’s see! matching our expectations, and the I/O reads. Question 5: What about nonclustered indexes? Oh no! We’re back to a scan operation. (This time, it’s a clustered index scan, since as mentioned before, a table is either a heap or a clustered index, and we just made the Customers table into the latter. But it get’s worse! The actual I/O reads have gone up! That’s because SQL Server is now also using the index nodes as it scans the data pages. What can be done about this situation? Add a nonclustered index, of course! and SQL Server has to go back to data pages to get the other columns in the row. The reason is a Key lookup because of how SQL Server builds nonclustered indexes. You would be forgiven for thinking that the nonclustered index contains a pointer to the pages containing the data row. Actually, that’s not how it works. Instead of a pointer (e.g. a sector number on disk), a nonclustered index keeps the clustered index key if there is a clustered index. Of course, before we got here, we put a clustered index on the Customers table! As a consequence, we get a key lookup. If you guessed that this means a separate lookup into the clustered index, you’d be right! So, the I/O reads are actually quite realistic. Question 6: What about included columns? How can they help? So, we can see the positive benefit of included columns. This naturally raises the question, “Why not just add the included columns to the index in the first place?” To understand why, first consider this: While key columns are stored at all levels of the index, nonkey columns are stored only at the leaf level. Lest there be any confusion, although a nonclustered index points to the data pages, its leaves are part of the B-tree itself. Storage cost. If the included columns are not needed for other types of searches, keeping them out of the key list makes for shorter index entries and a flatter B-tree. That results in less index I/O. SQL Server limits. Currently, you can have no more than 16 key columns in an index, and altogether those key columns cannot exceed the maximum index size of 900 bytes. Included columns can be data types that are not allowed as index columns. For example, nvarchar(max), varbinary(max), xml and others cannot be key columns but can be included columns. When an index contains all the columns needed to satisfy a query, it is called a covering index. Including strategic columns in a nonclustered index can ensure that the most frequent queries can be satisfied entirely from the index without the need for key lookups into the clustered index. Though we haven’t mentioned it, you can put a nonclustered index on a heap – that is a table without a clustered index. In that case, any lookups into the data pages are RID lookup. The “R” stands for Row and RID consists of a virtual address that includes the file number and page number of the data page and the row slot within the data page. Question 7: What about primary keys (and keys in general)? So far, we’ve avoided any discussion of primary keys. That’s not an accident. Too often clustered indexes and primary keys are conflated as if they are one and the same thing. They are not! That’s why we’ve left them until now. It’s best to get a solid idea about types of indexes before introducing keys. Notice that the statement adds a constraint, not an index. It adds just such a constraint on the CustomerID column. Now, since we already have both a clustered index and a nonclustered index, this produces an interesting result. In SSMS Object Explorer, we now see three indexes! The new one has been created as a backing index to implement the constraint. Note that it is nonclustered. If you thought that primary keys have to be clustered indexes, think again. It is interesting that SQL Server did not recognize that there is already a covering clustered index and use that one. I suspect that building indexes the way we’re doing it here is good for instruction but not optimal for proper design, so the SQL Server development team has not yet worked on this edge case and may never do so. Before we added the primary key constraint, it was possible and permissible to add new customers with the same customer IDs as existing customers. Go ahead, try it! Now that the PK is in place, though, that is no longer possible. Primary keys are necessary to make a table conform to relational theory. In practice, they are highly useful (as are unique keys) for referential integrity and a good way to get the database to check your assumptions about incoming data. Question 8: Should my primary key also be the clustered index key? However, just because it’s the default action, that doesn’t mean its always the best choice. While a primary key needs to be backed by an index to implement the constraint, the index does not need to be clustered, as we saw above. Furthermore, the goals of primary keys and clustered indexes may not be the same. The index allows for a seek operation to be used, which normally takes less I/O. On the other hand, clustered indexes can provide a performance advantage when reading the table in index order. This allows SQL Server to better use read ahead reads, which are asymptotically faster than page-by-page reads. Also, a clustered index does not require uniqueness. If two or more rows have the same clustered index key, a uniqueifier is added to ensure that all rows in the index are unique. Here, we’re assuming that most reads are done by last name, first name (the clustered index) and that most searches are done by CustomerID (the primary key). (SQL Server will add a uniquifier to the clustered index since it doesn’t know if there will be key collisions or not.) The point here is to carefully consider which arrangement is best for a new table. Consult with business users about how the table will be used. Remember that most reporting is sequential in nature. Choose your indexing accordingly, then test it. Use real workloads and see if actual usage is still a good match for the indexing scheme. If not, adjust it to suit. The text in green, above, is just such a message. Basically, SQL Server is saying that if there were an index on the CustomerID column, the cost of the overall query could be reduced by 99.8%! That would reduce the cost to almost nothing. Instead of a table scan, it could use an index seek operation. Question 10: Can I have too many indexes? There is actually advice out in the wild stating that you should just index every column in your table so that no execution plan will ever have a missing index. Is this good advice? Once again, it depends. Data warehouse databases often have a calendar table. That table will have a row for every date and columns for every conceivable use: MonthNumber, QuarterNumber, HalfYearNumber, MonthText, FullDateText, Is_Holiday, Is_BusinessDay, and many, many more. Such a table is static. Often the primary key (and clustered index) is an integer or date column with the date matching the other columns in the row. This table never (or rarely) changes. Also, it is not too big. (How many rows would you need for a century?) On such a table, indexing every column can make sense. You can have filtered indexes for the various flags, ascending and descending indexes, most of which will be nonclustered. Now consider our Customer table. If we index every column, what happens when we insert a new customer? All those indexes must be maintained! This work can add up quickly, so unless you have a static table (such as a calendar table), indexing every column is usually a bad idea! Properly indexing a SQL Server table is key to providing consistent, optimal performance. There are many things to consider when designing an index structure. Almost none of those considerations can be done without consulting the business users who understand the data and how it will be used, though it may well turn out that, after the new table has been in use for some time, that other indexing options will present themselves. 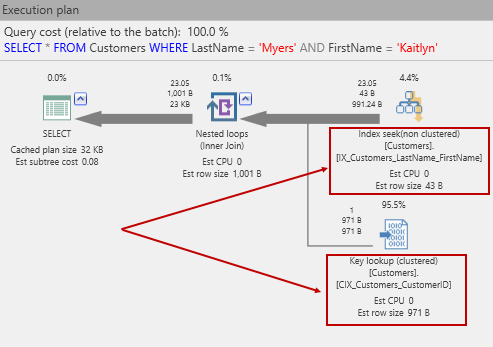 This article has attempted to answer some of the most important questions about indexing in general and specifically how it is done in SQL Server. We’re really only scratched the surface though. Each question answered here could be its own complete article and possibly a series of articles! Also, we’ve not addressed other types of indexes at all (e.g. XML indexes) nor have we looked at in-memory objects and how those change the picture for newer editions of SQL Server. Please stay tuned for more in-depth articles on SQL Server indexing.